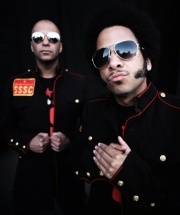 Street Sweeper Social Club is a rock/rap supergroup founded in 2006 by Rage Against The Machine's Tom Morello and The Coup's Boots Riley. Their self-titled debut album was released in June 2009. They supported Nine Inch Nails and Jane's Addiction for the NIN/JA portion of the Wave Goodbye Tour and appeared on the NINJA 2009 Summer Tour EP. During a live show, Trent Reznor made a surprise appearance on stage with the group and they performed a cover of the MC5 song "Kick Out The Jams". The band's initial name was Street Sweeper, but due to a copyright claim of a band with the same name the group extended their name to Street Sweeper Social Club. Trent Reznor and Street Sweeper Social Club performing "Kick Out The Jams"
This page was last modified on 11 January 2015, at 22:42. This page has been accessed 17,164 times.